When it comes to kayaking, I'm a big fan of the half-day trip. Short trips close to home are easy to fit into our weekend schedule and use less gasoline. They also meet my "unofficial" rule: our time on the water should be longer than our drive to get there. That means we usually kayak within 50-60 miles of home since we rarely spend more than two hours on the water. After four years of kayaking, though, I'm feeling the need to break my own rule and branch out a little. So here's my fall kayaking wish list -- most of these waterways are about 1 1/2 to two hours drive for us, but they might be right in your backyard. Please write and let us know if you've tried them! Merrymeeting Marsh in New Durham: This marsh wasn't on my radar until I followed a link to an article fromTwitter. While there's road noise here, it also sounds like an easy access place to take in some fall color and possibly see some waterfowl. 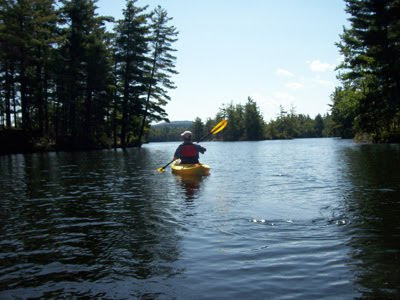 Connecticut River from Cornish: From their 40-acre farm, North Star Canoe Rental offers a full-day (12-mile) trip and a 4-mile, family-friendly paddle -- that's the one for me! Along the way, you'll see the Cornish-Windsor covered bridge and an island where you can take-out and relax. Rent a canoe or kayak on-site or bring your own. Pillsbury State Park in Washington: An article in the Boston Globe tipped me off to this place in the southwestern part of the state. The Park has many features, including May and Butterfield Ponds, linked by a narrow channel. Sounds like a great place to "get away from it all" without having to travel too far off the beaten path. 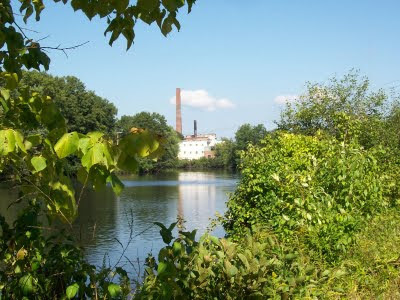 We've biked Mine Falls Park near our home in Nashua many times. Would love to hear from you if you've been there. We took a short visit to Saint-Gaudens National Historic Site in Cornish, NH after paddling Grafton Pond last Saturday. If you enjoy art and nature, it’s definitely worth a stop. It’s a beautiful outdoor site featuring the home, gardens, and studios of Augustus Saint Gaudens, a noted American sculptor during the 19th and early part of the 20th centuries. Saint-Gaudens created public monuments, cameos, and portrait reliefs, as well as some of the first sculpted U.S. coins. Some of his most celebrated works are of Civil War heroes. 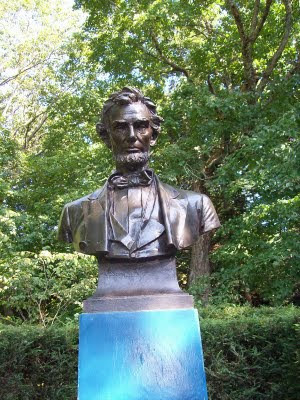 We saw beautiful recasts of some of his work, including one of the Lincoln statue (above) that stands in Chicago. Other original works are in Washington, D.C., on Boston Common, and in Central Park, to name a few. While Saint-Gaudens work is definitely impressive, I was most captivated by a current exhibit featuring the work of Massachusetts artist Alan Colby. Colby has sculpted 200 heads out of limestone of people he’s met at the Dorchester House in Boston. You can see some of them above. His exhibit runs through October 31st. Aside from taking in some artwork, we walked on the Ravine Trail, a fairly steep ¼ mile trail that takes you down a path along the “Blow-Me-Up-Brook” and ends with a swimming hole built by Saint-Gaudens. There’s also an outdoor marble temple where the ashes of Saint-Gaudens and many family members are buried. All in all, our stop at this historic site was a great little side trip on a beautiful summer day. Things to Know Before You Go: The site is open daily from late May through late October. Admission is $5 per person. On Saturday, Sept. 26, 2009 admission is free in honor of National Public Lands Day. Visit the Saint-Gaudens website for more details. Be sure to add this place to your wish list and if it's already there, then I would recommend moving it to the top of the list -- don't wait two years like I did! Doug and I kayaked here mid-day on Saturday (during Labor Day weekend) and found the parking and boat launch busy. 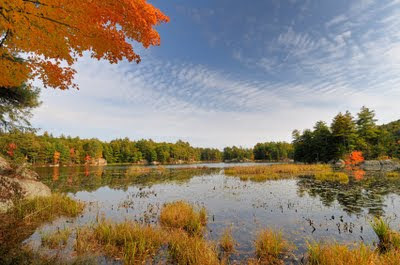 But once you’re out on this 235-acre pond, it almost feels like you have the place to yourself. There's plenty of water and shoreline to explore without feeling crowded. Apart from that, what makes Grafton so special? First, the things it doesn’t have: motorboat traffic (gas-powered motors and those larger than 6hp are prohibited); road noise (no major roads nearby) and shoreline development (I counted only 4 houses). 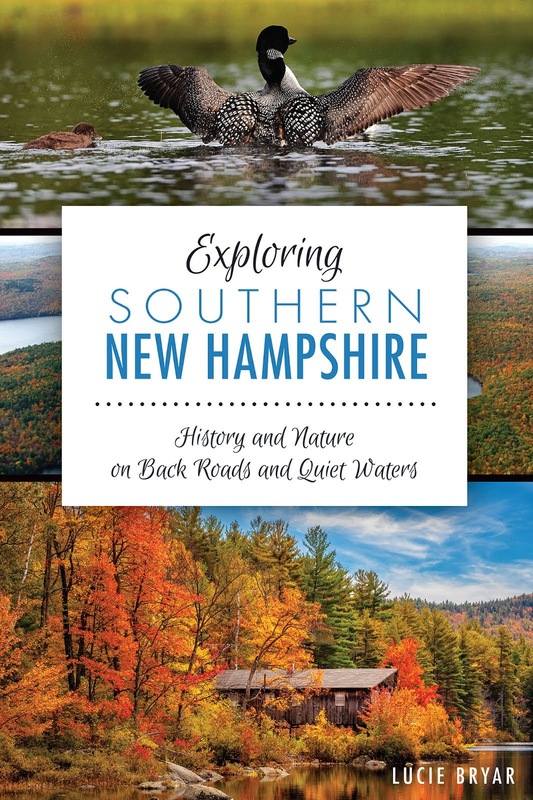 I learned afterwards that most of the land around the pond is protected by the Society for the Protection of New Hampshire Forests. Thank you, SPNHF! 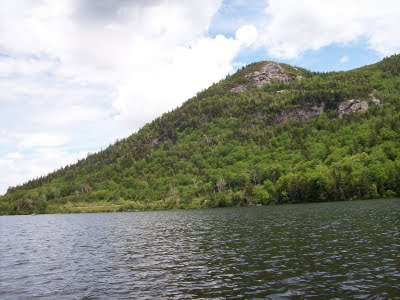 And now for some positive features that Grafton Pond does have : it’s dotted with many rocky islands, marshy inlets, and deep coves that invite exploration. Apparently, there’s good fishing for smallmouth bass, thanks to the pond’s underwater habitat. It’s fun to paddle around the islands, not sure what you might find on the other side. We didn’t go ashore, but we may do that next time. Grafton also has abundant wildlife (according to the AMC guide), including a number of nesting loons. We saw a total of four loons, more than we’ve ever seen in one place. There was an adult pair and a mother and chick. We watched as the chick sat on the surface of the water, while its mother dove deep to catch fish; then she would surface and feed the chick. How cool! We had a great time at Grafton Pond yesterday and will definitely be returning, maybe earlier in the day next time so we can spot more wildlife. Things to Know Before You Go: The boat launch is shallow and easy. There's a parking area that accommodates about 15-20 cars and there's also one port-a-potty. Safety: There are many granite outcroppings and fallen trees (true of all ponds this season), so be watchful. We also had to contend with a wind-driven current in open areas that got quite gusty at times. Getting There: This is one time when the directions in the AMC Guidebook threw us off track. Here’s how we eventually got there: From southern NH, take 89-North to exit 17. Follow Route 4-East to 4A, which takes you past Mascoma Lake and through the town of Enfield. Take a left onto Grafton Pond Road (about 9-10 miles from exit 17). Follow this dirt road to the end, take a right and the boat launch is on your left. P.S. We combined our paddle at Grafton Pond with a side trip to Saint Gaudens National Historic Site located about 20 miles away in Cornish, NH. Will post more on that later.